Turntable genius and mixtape maestro Buddy Peace returns with his first official digital long-player, released on the Strange Famous label. Blending together supremely artful drum-sculpting with snippets of more abstract sounds (as well as a wide-ranging palette of vocal samples, this makes for one of this year's more interesting and organically experimental hip hop instrumental suites. More so than on most albums of this ilk, Buddy's music really takes you on a journey of some sort, but better still, along the way your travelling companions will be a dazzling array of beats, ranging from dark and jazzy, off-kilter figures (as on 'Hawkstring Corpse') to heavier, hiss-laden break treatments ('Arcade Murderflash'). 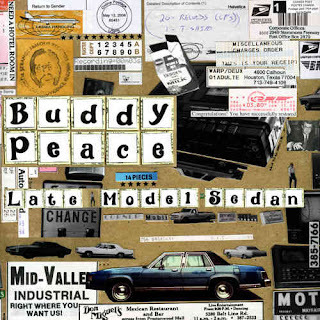 Expertly put together and inventive throughout, Late Model Sedan comes recommended to all open-minded hip hop heads.